I exercise my body to prepare for activities like gliding and battling machines in the Yonders. But I also exercise my mind. 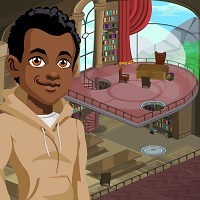 You'll find me in the Library in Lightglider Academy most of the time. I know that there are many different beliefs, faiths, and ideas about truth in the world. It is important to know the reasons why I believe what I believe. I want to be passionate about my faith in God, and I want my faith to rest in truth. The greatest source of wisdom and truth I've ever known is the Bible. In it is God's story for humanity. It shares how He created us, loves us, saves us, and will restore this broken world. There is always more to learn from books, Bible studies, and meaningful conversations with others. Take time to read, to listen, to think, to reflect, to pray, to journal, and to discuss. My Glidebook helps me do all of these things. Do you use your Glidebook? Get on it! we gotta mostly restore the world, but i like that you take care of yourself, body and mind, and it's not always important to believe what you believe cause nobody has to agree with it.